Ronda Rousey and Brock Lesnar will both be at Raw in Anaheim, New Japan announces the main event for Strong Style Evolved, brackets released for the New Japan Cup, Dana White meets with Brock Lesnar, Jon Jones hearing with the CSAC is on Tuesday, UFC on FOX audience, recipient of the WWE's Warrior Award at the Hall of Fame, and more. **Wai Ting and I will be back later tonight with a review of Raw and discussing the episode and taking your questions and feedback. **A full report on the WWE Elimination Chamber card from Sunday night. **We have results and notes from Sunday’s Progress Wrestling Chapter 64 card, courtesy of Matthew Smith. **Raw will take place at the Honda Center in Anaheim, California and Ronda Rousey will be making her first Raw appearance on the show. It’s a historically significant building for Rousey, who made her UFC debut in the venue in February 2013 against Liz Carmouche at UFC 157. Brock Lesnar will also be on tonight’s show (he was in Las Vegas a day early, see MMA section) and will have a faceoff with Roman Reigns as they move towards WrestleMania with the big promotional build of the show. **John Cena cut a very strong promo during “Raw Talk” after the Elimination Chamber. It was Cena portraying a defeated star, who was questioning if he still has it and questioning if he will be able to contribute at WrestleMania. Cena ended the promo by stating he had one more plan. It is worth noting, Cena is advertised for the Fast Lane event on Sunday, March 11th in Columbus, Ohio and it would make sense that he could show up on SmackDown and challenge Shinsuke Nakamura for his spot in the WWE title match. Nakamura doesn’t have an opponent for Fast Lane and it fits the story that they are telling with Cena. **The SmackDown crew has a house show in San Diego tonight at the Valley View Casino Center. It is interesting to note that the top three matches advertised are all multi-person matches with A.J. Styles vs. Kevin Owens and Sami Zayn in a handicap match, Bobby Roode vs. Jinder Mahal vs. Baron Corbin for the U.S. title, and The Usos vs. New Day vs. Shelton Benjamin and Chad Gable for the SmackDown tag titles. **The WWE’s Tuesday night television tapings take place from the Staples Center in Los Angeles with SmackDown, 205 Live, and the Mixed Match Challenge. **15-year old Jarrius “JJ” Robertson will be the recipient of the Warrior Award at the WWE’s Hall of Fame ceremony on Friday, April 6th at the Smoothie King Center in New Orleans, Louisiana. Robertson has dealt with a liver disease known as biliary atresia, which has required Robertson to undergo 36 operations and two liver transplants. He is a native of New Orleans and has been featured on WWE programming in the past and was part of the NBA All-Star Weekend in New Orleans in 2017. Robertson also received the Jimmy V Perseverance Award at the ESPY Awards in 2017. **New Japan Pro Wrestling made several announcements on Sunday night for their schedule in March. The Strong Style Evolved card in Long Beach, California will be headlined by Kenny Omega and Kota Ibushi taking on The Young Bucks, which is a big main event for that show and is a first-time meeting. The angle was shot at the close of the second Honor Rising event on Saturday with the Bucks challenging Omega and Ibushi. The other match added to the March 25th card in Long Beach is the U.S. title match with Jay White defending the title against Hangman Page. Page has been booked very strong over the past month, including pinning White on Saturday during their six-man tag match at Korakuen Hall. The only other match on the card so far is the Rey Mysterio vs. Jushin Thunder Liger match, which was set up earlier this month at the New Beginning in Osaka card. Tickets at the Walter Pyramid in Long Beach sold out in less than 20 minutes with more than 4,700 tickets sold during that window. **Bianca Belair did not work the rest of the NXT shows over the weekend in Canada. There was an awkward ending to Belair’s match with Ember Moon last Thursday in Mississauga where it appeared Bianca was hurt after taking the Eclipse. She was tended to by the referee after the match and walked to the back. The remaining shows featured Ember Moon working three-way matches with Nikki Cross and Aliyah. **The WWE stock saw a notable jump on Monday, opening up at $37.12 and closing at $38.28. **Ronda Rousey posted an Instagram clip of her husband Travis Browne and Daniel Cormier watching the Elimination Chamber Match from Sunday night. **MLW has added a singles match between Barrington Hughes and Vandal Ortagun for their Spring Break ’18 card on Thursday, March 8th in Orlando, Florida at the Gilt Nightclub. **CZW has announced that Will Ospreay will take on Dezmond Xavier on Saturday, April 7th in New Orleans during WrestleMania Week. The CZW card takes place at The Sugar Mill on Saturday at 3 pm local time and is part of the WrestleCon group of events. **Impact Wrestling is holding a media call with Tyrus on Tuesday at 2 pm Eastern. **NXT has announced house show dates for April 19th in Washington, D.C, April 20th in Bethlehem, Pennsylvania, April 21st in Bel Air, Maryland, and April 22nd in Johnstown, Pennsylvania. Tickets for the shows go on sale this Friday at 10 am Eastern. **The Jon Jones hearing in front of the California State Athletic Commission will take place at 1 pm Eastern on Tuesday. 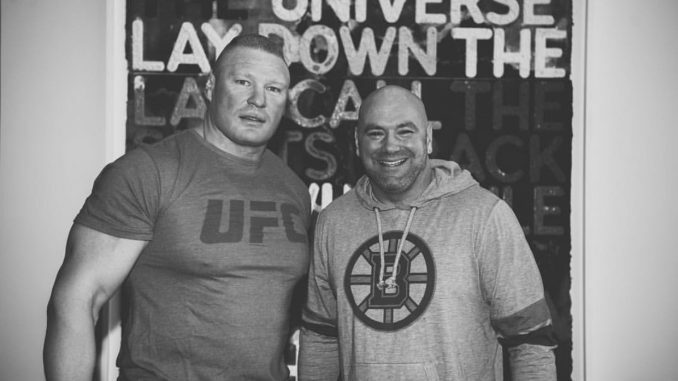 **On Sunday night, UFC president Dana White posted a photo with Brock Lesnar, which MMA Junkie’s John Morgan confirmed with White was taken earlier in the day. The photo was posted right as the Elimination Chamber event was starting and designed to ramp up speculation that Lesnar is eyeing a return to the UFC once his WWE contract expires later this year. Contract season has become an art form for Lesnar, who plays his cards extremely close to the vest and has successfully managed to create leverage for himself in every contract situation. There are several factors to look at, the first is that Lesnar still has time remaining on a one-year suspension from USADA for his drug test failures in 2016. Lesnar failed an out-of-competition test on June 28th and a fight night test on July 11th, 2016 and tested positive for clomiphene and hydroxy-clomiphene. He was suspended for one-year by both the Nevada Athletic Commission and USADA and issued a fine of $250,000. The Nevada suspension has expired. That USADA suspension was frozen last year when Lesnar retired and was removed from the USADA testing pool. There is a protocol on USADA’s behalf where if a fighter re-enters the pool, only the fighter or their promoter can release that information as USADA will not comment on the status of a fighter’s activity in the pool or not. Lesnar would need to serve the remaining six-months on his suspension before he could fight again. If it is believed that he has yet to re-enter the pool, that would mean he isn’t fighting until the fall at the earliest. Another important factor is the status of Jon Jones, who will have his hearing in front of the California State Athletic Commission on Tuesday for his drug test failure stemming from his fight with Daniel Cormier last July at UFC 214. Jones failed a drug test that was administered after the weigh-ins, the day before their fight with the news releases several weeks later when the results came back. Jones’ side is confident he will receive a reduced sentence and that it was a tainted supplement he took. A lot is a stake for Jones this week as it is his second infraction and his defense will play a major factor in his career trajectory as he could be facing a multi-year suspension or a massive money fight before the end of 2018 if Lesnar returns. Lesnar will be turning 41 years old this July and it’s impossible to gauge what his mindset is. I feel the Jones’ hearing this week will play a big factor. If Lesnar is coming back to the UFC and the options on the table are Stipe Miocic, a rematch with Cain Velasquez, or Francis Ngannou, while all those fights would be big they wouldn’t be in the league of a blockbuster fight that Jon Jones would represent. If Lesnar simply wants the best deal, this could all be posturing to drive up his bargaining power with the WWE. On the WWE’s end, this entire contract cycle dating back to 2015 has been building to Roman Reigns defeating Lesnar at WrestleMania and it’s been held off until this year. If you are Lesnar, it would be natural to assume that the WWE may feel they have gotten their value out of Lesnar and he isn’t worth the enormous salary for another 2 or 3-year deal at his age. One aspect I am confident in is Lesnar’s love for fighting and I don’t think there is any higher point for him than competing in big fights. I was in attendance for UFC 200 and Lesnar’s post-fight press conference, where Lesnar was on top of the world and felt so happy to be fighting and on that night, I felt there was no doubt he would end up fighting again (this was before the drug test failures were public). It would require a lot of effort and work for Lesnar to undergo another big fight camp, but if there is a Jon Jones level of a fight at the end of that camp, it’s a possibility if Jones is given the ability to fight later this year. **Saturday night’s UFC on FOX card averaged 1,822,000 viewers featuring Jeremy Stephens defeating Josh Emmett by KO in the second round of their featherweight main event. The audience was up 14.7% from their last effort on FOX this past January, which did an all-time low of 1,593,000 viewers featuring Ronaldo “Jacare” Souza vs. Derek Brunson in the main event. **The UFC’s next FOX card will take place on Saturday, April 14th and features two incredible action fights scheduled for the main card with Dustin Poirier vs. Justin Gaethje in the main event and a welterweight fight between Carlos Condit and Matt Brown. **UFC light heavyweight champion Daniel Cormier and Cain Velasquez attended the Elimination Chamber card in Las Vegas as they are in town filming the current season of TUF. UFC lightweight Michael Chiesa was also at the card. **42-year old Mike Pyle announced on The MMA Hour with Ariel Helwani on Monday that this Saturday’s bout with Zak Ottow would be the final fight of his 19-year career. Pyle’s first professional fight was a bizarre one with future UFC light heavyweight champion Quinton Jackson at an ISCF card in Memphis, Tennessee in November 1999. The two fought at a catchweight after Jackson came in over the limit and Pyle was giving up at least 25 pounds to Jackson with the fight going down as a unanimous decision win for Jackson. Pyle would later become the WEC welterweight champion in October 2005 submitting Bret Bergmark and would vacate the title after Zuffa purchased the promotion. Pyle bounced around fighting for the IFL and later for Elite XC, including on the prelims of their inaugural show in February 2007 on Showtime. Pyle joined the UFC and debuted for the promotion at UFC 98 in May 2009 where he was submitted by Brock Larson. He has gone 2-4 since 2014 and lost his last two bouts to Alberto Mina and Alex Garcia, which were both knockout losses and has not fought since December 2016. His opponent this Saturday is 31-year old Zak Ottow, who has been fighting for the UFC since October 2016, is 2-2 in the organization and is coming off a TKO loss to Li Jingliang last November. The two welterweights are scheduled to headline the Fight Pass portion of UFC 222. **Bellator has announced that they will return to London, England at the SSE Arena for Bellator 200 on Friday, May 25th. They have announced that Rafael Carvalho will defend the Bellator middleweight title against Gegard Mousasi on the show and Michael “Venom” Page will be fighting David Rickel in a welterweight bout.